OS Explorer Map 121, 'Arundel & Pulborough'. Starting GPS Co-ordinates: N50 92' 90" W000 64' 10"
Finishing GPS Co-ordinates: N50 92' 80" W000 62' 00"
Unusually marked by a signpost that reads 'Public Way'. Although we're not really sure what that phrase actually means, this byway is open to motor vehicles. 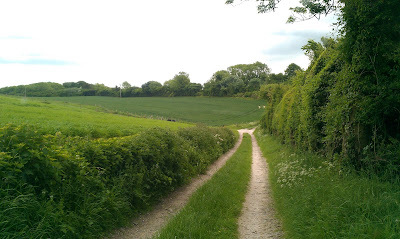 I cannot find a name for this trail anywhere, so for want of better I have christened it 'Wiltshire's Lane' after the barn of the same name located towards the eastern end. 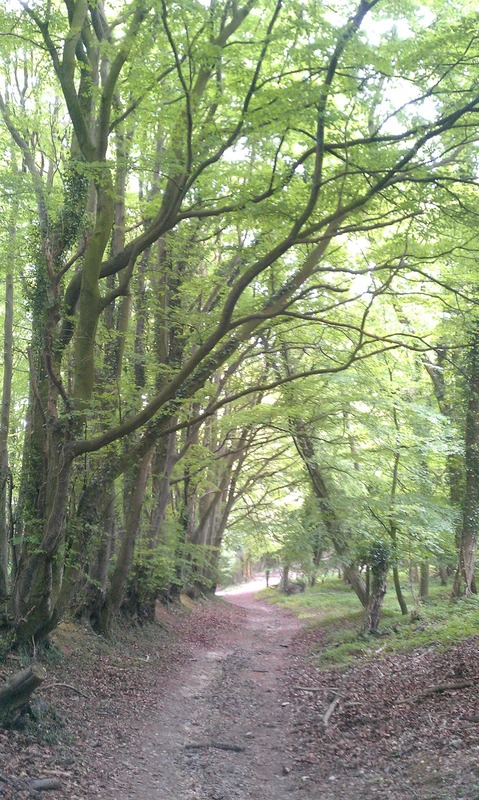 If anyone knows the correct name for this byway, please comment below! We drove this great greenlane in an easterly direction from the A285. The lane entrance itself is relatively well hidden behind a hedge when approaching from the north. The trail immediately heads uphill for a short distance on a surface of compacted chalk with grass running down the middle. The foliage is well kept for almost the entire length, as the western half at least seems to see a decent amount of usage from farm and forestry vehicles, so there is little chance of damaging your paintwork. The byway begins to ebb downhill, and as it does so it takes a brief turn to the south-east and heads down the flank of Barlavington Down before resuming its original track and following the contours of Farm Hill, heading uphill and past a large stack of felled timber on the northern side of the lane. This stack is reached just before the lane enters Northcomb Wood, and this entrance to the woodland is signed with a four-way signpost with a noticeboard about the LEAF scheme tacked onto it. Perhaps worth a read if you find the urge to 'brew up'. There are various entrances to fields here, and in the woods there are a couple of tracks the diverge away from our UCR, none of which are gated. It is obvious which way Wiltshire's Lane is headed, so please don't trespass and stick to the byway. Damaging crops and soil doesn't help anybody. On entering the pleasant Northcomb Wood the trail turns to the south-east and begins to fall ever-more-steeply downhill, whilst the chalk surface has seen some washout with heavy rains in April 2012 leaving a channel which criss-crosses the track, and as such it gets a little bumpy in places. Soon it passes a small chalk extraction pit on the southern side of the lane and eventually turns sharply to the north. Eventually the lane bottoms out and takes on final turn to the east, passes Wiltshire's Barn and finishes where it meets a country road called Folly Lane, just west of the beautiful village of Sutton. A great lane and well worth driving all the way out here for. Bignor Roman villa can be found to the east of the lane, which (apart from being generally awesome) has some of the best mosaics in the country on display. Definitely check it out. Duncton Hill viewpoint, which offers spellbinding views northwards over mid-Sussex, can be found on the sharp bends in the A285 just north of here. A great spot for a picnic (if you don't mind traffic...). And if you fancy some nosh and a top pint, visit The White Horse pub in nearby Sutton. Nice article i really enjoyed....thanks for sharing it. Not a problem, glad you enjoyed it! Driven July 4th 2015. In good condition, some minor washouts but easily passable in "softroaders". Nature is slowly closing in on the East end, provinding you fold away your mirrors and be careful you can get through. Recommended (for lunch) is the White Horse pub in Sutton nearby. Thanks for the info John! I have updated this post with details of your recommended drinking establishment.